Shirts With Random Triangles: Quintin Tarantino Drops Hints About A Possible Kill Bill Vol. 3. 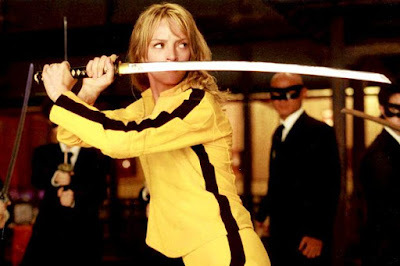 Tarantino says that he had approached Uma Thurman, about a third Kill Bill installment (or volume, if you will). “I am talking to Uma about it just a little bit," he said. There was no mention as to how open Thurman is for a return to The Bride's path of vengeance. Variety reports that Kill Bill and Kill Bill Vol. 2 made a combined $333.1 million dollars at the box office worldwide.